The Arabic language refers to Central Semitic languages that are closely related to Pheonician, Ugaritic, Aramaic and Hebrew. Its standardized written version is said to be distinct from other spoken varieties. This is also more conservative than the others. Two of the existing versions of the Arabic language now exist in a popular state called diglossia. This is now utilized side by side for various societal functions. If you want to become an expert in this language, then you should know that a few of its spoken versions are unintelligible mutually either on an oral or written basis. The different versions when viewed as a whole can also be expected to constitute sociolinguistic language. In other words, based on grounds that are completely linguistic, there is a great chance for these versions to form more than just a single language but you can expect them to be grouped commonly together as one language either for ethnic or political reasons or both. If one considers Arabic as only one language, then it is possible that it is already spoken by over 280 million people. Breaking this down in separate languages will result to the increase in the number of people who will speak the Egyptian Arabic version. Native speakers of this can be expected to be around 54 million. If you plan on becoming a real expert in speaking and writing the Arabic language, then you should know that the Arabic certification program which is now offered by a highly reliable online certification company called Brainmeasures can be your best ally. What makes this Arabic course amazing is its comprehensively developed and well-detailed topics. Brainmeasures also gives you the opportunity to enjoy the Arabic training that it offers which explains everything about the Arabic language, its history, its native speakers, its different varieties, the different countries with people who speak its different varieties right now, the basics of speaking and writing it and the different rules and procedures in speaking and writing this language. 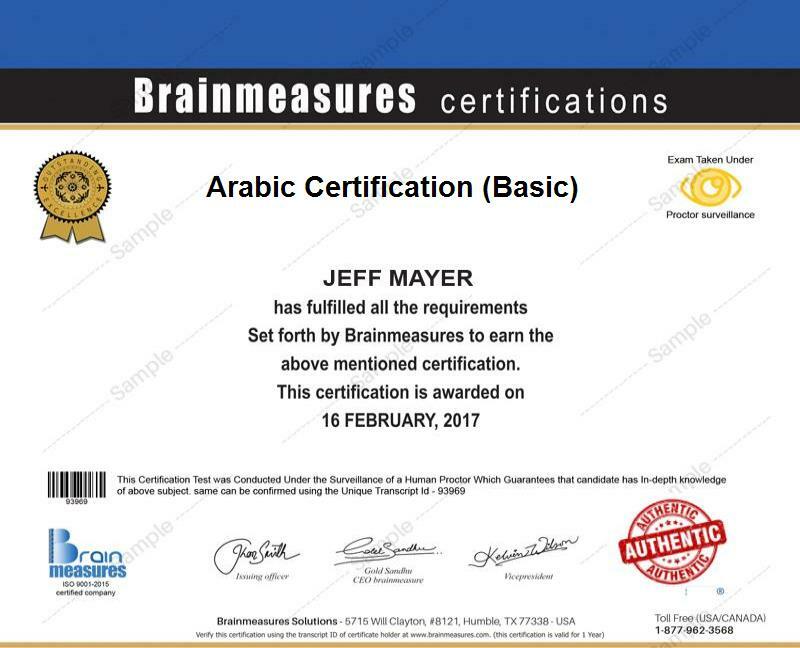 Receiving an Arabic certificate from Brainmeasures is extremely useful in your attempt to prove to everyone that you are one of the best speakers and writers of this language. You can also easily complete an Arabic to English course through the knowledge that you have generated from this specific online certification course. Anyone who wishes to become more fluent in Arabic and enjoy a more flourishing career because of this fluency and skills can take part in the Brainmeasures Arabic certification program. What makes Brainmeasures truly remarkable is that it does not require all the aspiring participants of its programs to meet strict requirements so you have a guarantee that you will be easily admitted into this program. A more stable pay can also be offered to Arabic certification holders so rest assured that you will definitely enjoy the results of taking up the course. With the presence of your Arabic certification, you can easily get the position of an Arabic language instructor which increases your chances of earning around $54,000 annually. Working as an Arabic analytical linguist is also possible and this will let you earn around $57,000 to $97,000 yearly.